“There was a raja named Uparicara, a dharma-following monarch, fond of hunting,” is how Vaishampayana begins the detailed recital of his guru Vyasa’s Mahabharata (MB) at Janamejaya’s request, striking what McGrath regards as the keynote of the epic: kingship. Buddhadeb Basu was the first to argue that Yudhishthira, not Krishna or Arjuna, was the protagonist of the MB in Mohabharoter Kotha (1974), Englished by Sujit Mukherjee as The Story of Yudhishthira (1986). 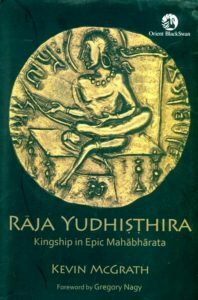 McGrath’s sixth book on the MB studies Yudhishthira as a model of dualistic monarchy, shared with Krishna and his brothers, in a “pre-Hindu,” pre-monetary, pre-literate Bronze Age society of the first millennium BC. This monarchy, based upon agreement of the family, the clan and the people, is juxtaposed with the Shanti Parva’s paradigm of autarchy (“more classical, early Hinduism”). McGrath strongly feels that it is Mauryan and, even more so, Gupta epitomes of kingship that are represented here. Vaishampayana ends saying that this “itihasa” named Jaya is to be heard by one who desires to rule the earth. The epic, therefore, is focussed on kingship. McGrath also explores how pre-literacy is portrayed, again dually. Externally, there is the drama of recitation before an audience; internally, the narrative of Yudhishthira’s kinship group which is the foundation for preliterate poetry. The great variations in style are evidence of different poetic traditions that are amalgamated into a single vast poem: Vedic, pre-Hindu, Hindu, Jain, and Buddhist. McGrath believes that MB became a written text in the time of Samudragupta, which is why a coin of that king features on the cover. However, he falls into the trap of believing that one person could not have composed the MB. What about the enormous output of Isaac Asimov in almost all branches of knowledge in modern times and of Shakespeare in the past with wide stylistic variations? he was called a raja. the welfare of his subjects. The raja drew his authority from the people who, in return for his protection, gave him one fiftieth of their animals and gold, a tenth of their grain and the loveliest of their daughters (Shanti Parva, 67.23-24). It was a time when money did not exist and writing was unknown. Wealth acquired by the raja consisting of precious metals, gems, cattle, but not land, was distributed by him during yagyas and other ceremonies. Succession to the throne was not by primogeniture alone and needed ratification by the people. For instance, Bharata disinherited his nine sons finding them unfit to rule and adopted the Brahmin Bharadvaja as his successor, naming him Vitatha. Yati, Nahusha’s eldest son, was not his successor but the younger Yayati. Yayati had to explain to the people why he gave the throne to his youngest son Puru. Brahmins did not agree to enthrone Pratipa’s eldest son Devapi who became a sanyasi. So the youngest, Shantanu, became king. Again, it was Vichitravirya’s younger son Pandu who was made king. McGrath makes out a strong case for the MB being about the establishment of Yadava hegemony ( pointed out in 2002 in my paper “Leadership and Managing Power: Insights from the Mahabharata”). The displacement of Yayati’s eldest son Yadu in favour of the youngest Puru comes full circle. However, it is not “a son of Krishna” (an error repeated twice) who becomes king at Indraprastha, but his great grandson Vajra, while his sister’s grandson rules at Hastinapura. McGrath expands this idea to envisage a conflict in which a matriline defeats a patriline. Actually, it is Satyavati’s line that is displaced by her daughter-in-law Kunti’s. McGrath appears to be supporting the idea that the matriline represents “indigenous” Dravidian traditions that defeat “intrusive” Indo-Aryans. Thankfully, he refrains from stepping further into this morass. We find here a new insight: royal authority is portrayed as dualistic, being shared by Yudhishthira with Krishna in both the major rituals of rajasuya and ashvamedha. Before that, authority is shared between Satyavati, Bhishma and Vyasa. Royal power depends upon support of the community who are represented in the group of ministers chosen from all four classes. Yudhishthira’s is also a fraternal kingship shared with his brothers and even with Dhritarashtra. Thus, after Karna is dead, Yudhishthira tells Krishna that now he is raja of the world along with his brothers. McGrath pertinently points out that “kingdom” has its origins in the Old English “cyn” standing for “kin” and means “the situation or location of kinship” which does not connote rule by one person, which is the model Bhishma presents in the Shanti Parva. When Vyasa is called “brahmarshi kavih” McGrath has problems finding an English equivalent for “rishi”. Not happy with “wizard” he leans towards “shaman”. The Oxford English Dictionary glosses “rishi” as “A Hindu sage or saint”. The exact equivalent would be “seer” in the sense that MB uses it. The “kavi” is a seer-poet. Shantanu is the only one called “adhiraja”, superior monarch. This is significant because it is the dynasty of his step-father with which Vyasa is concerned, having been inserted into it by his mother to carry it forward. The royalty of the bloodline, therefore, becomes dubious, particularly when Pandu’s wives gets sons from multiple devas. It is interesting that McGrath does not examine this aspect of Yudhishthira’s claim, despite Duryodhana questioning it bluntly. The need for the people’s acquiescence to legitimise the kingship seems to be more implicit than voiced explicitly. McGrath overlooks that Yayati has to explain to the people why he is choosing his youngest son. However, we do not see Shantanu doing the same in the case of Devavrata, nor do the people protest. They only object vociferously when the Pandavas are exiled, but this carries no weight with Duryodhana who appears to represent the “later” type of autocrat, though not a tyrant since the people tell Dhritarashtra they were happy under his reign. The installing of Yudhishthira as crown-prince requires no consent from the public. Their applauding him is not evidence of public opinion featuring as a crucial element in making that decision as McGrath asserts. When he refers to Krishna in his peace-embassy appealing to the kings in the assembly to speak as evidence that Dhritarashtra has to heed the “sangha”, this would be because that is the mode of governance obtaining among the Yadavas. No one in the court responds to this appeal, because the modality of Hastinapura’s monarchy does not envisage such consultative rule. Duryodhana is not bothered about Krishna’s exhortation to behave so that the great warriors install him as crown-prince. He successfully asserts his right singly. The dharma of a raja had three qualities: punishing, protecting, donating. He rules, as Kunti tells Krishna, by conciliation, giving gifts, causing division, using force and strategy. Yudhishthira always speaks in terms of not just himself but always including his brothers (the most significant being sharing a wife). All decision-making is fraternal for him, except for the game of dice twice over. Krishna is referred to as sanghamukhyo, leader of the association. According to V.S. Agrawala, in Panini’s time the Bharatas’ profession was ayudhajivin (weaponry) and they lived as a sangha. The MB seems to be showing political systems changing from an oligarchic sangha and a kinship type of rule to absolute monarchy. Neither Parikshit as full-fledged monarch nor Janamejaya shares power with anyone. The Yadavas end up with Krishna’s great grandson Vajra ruling in Indraprastha, and the sons of Satyaki and Kritavarma ruling in nearby kingdoms. McGrath argues that three forms of time coalesce in the MB. There is the recalled pre-monetary, pre-literate time of sanghas; the time poetry creates representing an ideal; and both are conveyed through the time of actual performance. Thus there is “a compounding of the historical, the mythical and the performative which coalesce into a single instance or event that has been simply transmitted and then recorded in our present text of the poem.” An impressive thesis indeed. A very interesting proposition in the book is that Parashurama’s genocide of Kshatriyas might represent destruction of Buddhist kingdoms east of the Ganga-Yamuna doab. But where is the evidence for this? J. Bronkhorst proposed that the MB’s earliest written text is from the time when Brahmanism was imposing itself on eastern regions viz. Magadha. The Bhargava Brahmins, whose tales feature prominently in the MB, would have been linked to this expansion. It is not clear why the MB should be recalling “an imagined former era” of war-chariots, when Persian armies used them against Alexander. Nor is there a shift away from the Rigvedic sacrifice which remains central to the MB. In the Shanti Parva, however, other ways of achieving liberation are described such as Sankhya and Yoga. Ritual sacrifice is even shown as of no consequence compared to the life of unchavritti (gleaning). These, as McGrath writes, could certainly be a response to Buddhism and Jainism. There are references to caityas (funeral monuments) and edukas (ossuaries) in the kingdom of Gaya. Bhurishrava is said to be meditating on mahopanishadam and engaged in yoga. The earliest Upanishads are dated to the middle of the first millennium BC. McGrath points out that Arjuna’s sword is described as akashanibham (blue like the sky). This is the wootz steel which was produced in North India in the 3rd century BC. Further, prior to the battle Uluka refers to the rite of weapon-worship (lohabhihara). Loha means “coppery, red.” McGrath interprets this as indicating bronze weaponry, thus bolstering his thesis about this being a bronze-age heroic culture. A significant point is that the term chakravartin, turner-of-the-wheel, is only applied to ancient rulers, never to Yudhishthira, who, therefore, was never given the status of an emperor despite the rajasuya yagya. When finally installed at Hastinapura, he is called patim prithvyah, lord of the earth. Other terms used are mahipati, nripa, bhumipa, narendra, nareshvara, synonymous with “raja”. Chakravartin is a term that was used by Buddhists and Jains, particularly in the Andhra region along the Krishna River. There is a curious incident usually overlooked which McGrath points out as an indication that kingship was oligarchic. After the Pandavas have been exiled, Duryodhana, Karna and Shakuni offer the kingdom to Drona considering him as protector, ignoring Dhritarashtra and Bhishma who appears nowhere at the close of the Sabha Parva. Where is the consent of the public? This recurs when Duryodhana, rescued by Pandavas from the Gandharvas, offers the kingship to Duhshasana. McGrath proposes that this is the consequence of the rajasuya having gone wrong so that royal authority seems to have become mobile. The Udyoga Parva has the subjects discussing Duryodhana’s destructive thoughtlessness (as citizens do in Shakespeare’s plays), a feature that never occurs in the type of kingdom Bhishma describes in the Shanti Parva. The mobile nature of kingship is seen when Karna tells Krishna that Yudhishthira would not accept the kingdom were he to know about Karna’s birth. Gandhari, however, is quite categorical that the Kuru kingdom passes by succession. The rajasuya instead of making kingship permanent for Yudhishthira completely upsets it. The MB seems to be presenting different claims to kingship without projecting a single model. It is subject to family, kinship, the clan, the public etc. The king’s primary duty is as a sacrificer, which McGrath analyses at length. The primary model is Indra, shatakratu (performer of a hundred sacrifices) the rain-bringer, promoting fertility. Satyavati urges Vyasa to provide a successor to the throne as a kingless kingdom gets no rain. As an offshoot of this, in old age the king finally takes to the forest as a renunciant, which does not form part of the paradigm of the later “classical” model of monarchy where he rules till death. Besides the pattern of the displaced eldest son in the line of succession, there is the feature of sons being born to queens not from their husbands (Ambika, Ambalika, Kunti, Madri). Further, the earliest kings did not take princesses as wives. Yayati has sons from Brahmin and Asura women; Uparichara from Girika, a riverine woman; Shantanu from Ganga and Satyavati, both riverine women. Only in subsequent times we find the practice of restricting the choice to royal families. McGrath is mistaken in stating that during Pandu’s rule Dhritarashtra declares Yudhishthira’s right of succession. By the time Duryodhana is born—which is the context of Dhritarashtra’s comment—Pandu has long given up the throne to his elder brother, retreated to the Himalayas, been cursed by the deer-sage and has persuaded Kunti to beget a son by the god Dharma. It is interesting that Yudhishthira is referred to as “ajatashatru” (whose foes are unborn), since this is name of Bimbisara’s son (491 BC) who killed his father and founded Pataliputra. It is not a name shared with Ashoka’s father, as McGrath states, who was Bindusara. Both expanded the Magadha kingdom considerably. Without conquering Magadha, Yudhishthira cannot become samraj (emperor). There is a historical memory here. Regarding the dice game, McGrath quotes Yudhishthira as having vowed never to refuse a challenge, which overturns the “fraternal kingship” paradigm. He seeks to cover this in a footnote pointing out that on the second occasion all the Pandavas were invited, not just Yudhishthira. He observes that while Draupadi was treated contemptuously, “there is no overt violence and a certain etiquette is observed.” What about being dragged by the hair and sought to be stripped naked? McGrath points out a fact that has been overlooked by others: Krishna’s report to Yudhishthira about what Dhritarashtra and Gandhari said supporting his rightful claim to the throne do not tally with what we have heard in the Hastinapura court! Similarly, Krishna’s report to Uttanka and to Vasudeva about the events of the war differ significantly from what Sanjaya has reported. Why? Another interesting sidelight is provided: Karna tells Krishna that Brahmins will recount the Mahabharata sacrifice. Why not the half-kshatriya sutas? This hints at the Bhargava redaction of the epic. Yudhishthira is said to have been guilty of lying only once although there is a series of lies all the brothers tell Virata. A very rare example of the fury Yudhishthira is capable of even against his own family is the curse he lays upon all women after finding out that Karna was his elder brother. In his aversion for the kingdom his parallel is Balarama who avoids the war. Yudhishthira’s renunciant bent has parallels in Buddhism and Jainism. In the Shanti Parva he uses a metaphor to describe worldly predicament which Shakespeare’s King Lear repeats: “Thus on this various wheel of samsara, like a chariot wheel…” A similar disgust for the kingdom won by slaughtering kinfolk is voiced by Arjuna the perfect kshatriya in the Ashvamedha Parva. McGrath holds that Vyasa is older than Bhishma and is not mortal. The timeline does not indicate that. Devavrata is returned to Shantanu as a teenager. Four years after that Shantanu weds Matsyagandha who has given birth to Vyasa earlier. Vyasa would be around the same age as Bhishma. Further, he is definitely mortal, not chiranjivi like Ashvatthama and Kripa. He is divine only in the sense that much later he tells his disciples that he is an avatara of Narayana. On page 107 there is a curious error: “Shalya’s driver is killed by Kripa”. This is a good example of the sort of mistake the editors of the critical edition made by ignoring logic to follow blindly the maximum manuscripts agreeing with the Sharada script version. It is Bhima who does this, following up by killing the horses and cutting away Shalya’s breastplate. Further, though displeased, Yudhishthira does not reprimand Bhima for kicking prone Duryodhana’s head, despite being urged by Krishna who does not justify this act as McGrath has it (p.108). Rather, Yudhishthira justifies Bhima’s kicking. It is good to find McGrath speculating about why the movement of the narrative was impeded by introducing the didacticism of the Shanti, Anushasana and Anugita portions instead of peremptorily rejecting them as interpolations. It is necessary to find out what possibly motivated the redacteurs to do this, and how it happened. Why stitch together such widely divergent types of poetry? This could only happen in a literate period. The manner in which Vyasa exhorts Yudhishthira to be king-like and emerge from depression by drawing upon traditions of ancient monarchy can be seen in the Old English poems “Deor’s Lament” and “The Wanderer”. McGrath compares this to the Gupta dynasty seeking to revive the ashvamedha rite to legitimise power and using the MB recital for this purpose. Why should we not see this as valid for the revival five centuries before that by Pushyamitra Shunga, a Brahmin general who assassinated his king and attacked Buddhists? The wrongs a raja commits are said to be removed by performing such yagyas and distributing donations. McGrath points out what is seldom realised, viz. that the warrior’s way, kshatradharma, is first spoken of by Hanuman and is similar to the catalogue in Arthashastra. The raja’s dharma is first enunciated by Narada at the beginning of the Sabha Parva. The Gita does not touch upon this, being directed solely at the hero. McGrath examines three instances when Yudhishthira is advised in practical terms how to function as a raja. Arjuna propounds practical tenets of governance; Draupadi holds forth on what is to be done in crisis; Yudhishthira has his own craving for liberation of the spirit. There is no mention of any ministers counselling him in Hastinapura. This characterises Bhishma’s picture of kingship. However, it overlooks the episode in the Adi Parva where the Machiavellian counsellor Kanika expounds his niti to Dhritarashtra for getting rid of the Pandavas. McGrath argues that the shift in oligarchic monarchy of the earlier books to a single person’s rule in the Shanti Parva is matched by development of a pre-monetary barter economy into one where currency is exchanged for goods. This is the time dominated by Jain and Buddhist merchant classes when fraternal kingship is replaced by autarchic rule. It is also the time of urbanisation when coins gradually replace land, agricultural produce and cattle as mediums of exchange. The lack of mention of coinage in the Shanti Parva is explained away as because it is describing a mythical time, “blurring historic and poetic reality.” That is not a satisfactory explanation and undermines the argument. When McGrath believes that the culture MB depicts is primarily a pre-monetary, pre-literate Bronze Age one as Homer’s epics do, why does he contradict himself by saying that it is only “an idealised old world” and “not a portrait of an historical reality, but a pictured heroic time”? Hasn’t evidence of the Homeric world turned up? The peculiar incident of the Brahmin Charvaka condemning Yudhishthira, which McGrath finds so puzzling, becomes clearer if we look at Duryodhana’s dying speech. Here he says that if the ascetic Charvaka, master of eloquence, hears how he has been killed in unfair combat, he will definitely avenge him. Even more intriguing is how Kripa, despite his role in the massacre of the Panchalas and Draupadi’s sons, goes unpunished and continues as guru to Parikshit. McGrath proposes that perhaps Sauptika Parva was a later phase of the epic’s growth featuring Kripa in assisting in the massacre. Vidura’s precepts and Bhishma’s discourses on kingship come to be collected in Kautilya’s Arthashastra, which is also an action-less monologue. This picture is an urban one of a classical king and his entourage. What is particularly shocking is Bhishma’s advice that Yudhishthira ought to fear kinsmen like death, because Yudhishthira’s is all along a familial kingship. But why is the use of spies Bhishma advocates “a new practice” (p. 156) when Duryodhana had all along been using them to track the Pandavas in exile? The two parvas are concerned with the king’s morals and are devoid of dramatic effect on either Bhishma or Yudhishthira. Only at the very end the Anushasana Parva says that Yudhishthira was anointed having obtained the kingdom. The heroic epic re-starts with the Ashvamedha Parva. These two books surely belong to a radically different poetic tradition, being upanishadic, not heroic. Vyasa presents us with three portraits of kingship: Dhritarashtra, Duryodhana and Yudhishthira. All display a dependence upon public opinion and the subjects appear to have been happy under the rule of all three. When Yudhishthira exits, he hands over the throne to the dual authority of Yuyutsu and Parikshit (the courtiers surround the former; the women the latter). He advises Subhadra to protect Vajra in Indraprastha and not follow adharma (i.e. seek to supplant him by her own grandson Parikshit). Like Arjuna much earlier, Yudhishthira enters heaven in his mortal frame—and yet he does not, because he has to experience hell. He is said to be filled with bitter rage here. He will not accept heaven without his brothers, just as he shared earthly power in their company. Only thereafter, having discarded his mortality, is he taken to Swarga. McGrath makes the very interesting point that the MB is recited at Takshashila, the capital of Gandhara (Kandahar), the land of Gandhari and Shakuni. Kautilya composed his Arthashastra here. Ashoka was viceroy here. The oldest manuscripts of the MB are from Kashmir. In his conclusion McGrath puts forward a very important suggestion for studying how the commentator Nilakantha prepared his edition of the text. While McGrath very rightly points out the puzzling omission of the Sindhu-Sarasvati civilization’s urban heritage in one place, in another he asserts it is “obviously recalled” without citing evidence. Just as in late 6th century BC Athens, in the Panathenaia festival, brought a re-conceived Bronze Age epic poetry into a single Pan-Hellenic form, so the MB integrated all available material on social living in a single collection. McGrath sees it depicting a religion of hero-worship which continues today. He is certain that the war books and parts of the Virata Parva are older, depicting an ancient Bronze Age warrior tradition, than the Shanti–Anushasana Parvas. Does the poem hark back only to the older world of Vedic deities? Does it not stress repeatedly the primacy of the Nara-Narayana duo and the underlying presence of Rudra-Shiva? Nor does it elide all Buddhist and Jain experience. There are negative references to kshapanaka (naked Jaina mendicant) and pashanda (Jains/Buddhists). The Mokshadharma Parva incorporates much of their concept of world-abandonment for the sake of individual salvation, quite contrary to the stance of the Gita and the kingship the MB portrays. The very concept of the supreme value of yagya is completely undercut at the end of the horse-sacrifice where the half-golden mongoose shows it is much inferior to what is achieved by those living by gleaning. The archetypal seer-king, rajarshi Janaka is thoroughly debunked by the female sanyasi Sulabha! In Yudhishthira’s intense remorse and obsession with dharma much of Ashoka is surely assimilated. Despite the MB’s final message that in Swarga there is no animosity, the entire epic has presented mutually destructive rivalry between cousins for the throne. Its message is dualistic like the model of monarchy it presents of a ruler making decisions in consultation with kin and with implicit, if not explicit, approval of the public. This portrait undergoes a development summarising “all the historical possibilities, if not temporal developments, of kingship in Northwestern India” around 950 BCE onwards. McGrath’s description of the krita yuga as a timeless, changeless, deathless utopia is not correct because monarchs and sages of that period are shown as dying. It is the passage of time that leads to the onset of the treta yuga. While acknowledging that no dates with full astrological data are supplied, McGrath seems to accept A.N. Chandra’s date for the battle as 3137 BCE. Based upon the same data, widely different dates have been arrived at by a range of scholars, showing that interpretation is highly dubious. McGrath estimates the time-span for the core narrative as spanning fifty years from the infancy of the Pandavas to the investiture of Parikshit. Into it are interwoven tales from the past featuring Vedic divinities as well as the ethos of early Gupta monarchy. The poem oscillates between the microcosm and the macrocosm. Centripetal in form, the stories are narrated in manifold voices creating a tapestry of coruscating brilliance that evokes willing suspension of disbelief. Just as time in the MB is an illusion, so is space. There is very little description of interiors and topography except in very general terms. It is place-names that feature, not details of terrain. Similarly, details of physique are elided. Individuals are made out mostly by their speech, for it is a world of drama. It is not a poetry of realism but of emotional theatre and didacticism. There is no reference to plastic and visual arts (except a single mention of Shikhandini being adept at “lekhya” i.e. writing or painting), which might be because the first statuary is Buddhist, mention of which the MB seems to avoid. In the appendix on epic pre-literacy McGrath takes the position that the MB was first written during Samudragupta’s reign combining the pre-literate and literate. Writing is dateable to Mauryan times. The different parvas exhibit great stylistic differences, incorporating popular songs about heroes, folklore and formulaic compositions of professional poets. Sanjaya’s inspiration, which is visual, differs from Vaishampayana’s which is a recital of remembered text. Sanjaya’s is filled with formulaic terms and comparatively little narrative. An excellent example of such epic inspiration is found in the Russian bylina recorded in 1925 by N. Misheyev. Different periods of theological and political thought have been combined along with varied cultural strands. Preliterate narrative is not chronological but proceeds structurally, which we see in the MB. Further, it is based upon the functions of kinship, and its performance is dramatic and metaphorical. Preliterate poetry is also characterised by a pattern of duality (as seen in the Iliad too) which is a function of pre-monetary culture where no single currency existed. Society functioned on exchanging services and loyalties defined by rites. Value depended upon kinship. Wealth was distributed in great yagyas and weddings in the form of jewels, weapons, cattle, servants, but not land (gambling is the exception). Writing and coinage seem to have occurred together. This, of course, begs the question about Harappan culture which had seals and a specific system of weights, neither of which the MB mentions despite featuring Jayadratha as king of the Sindhu area. McGrath’s slim volume is a densely written book offering new and rich insights into an aspect of the MB that has not been researched so thoroughly in the past. No one interested in the MB can afford not to read it. Kevin McGrath: Raja Yudhishthira—Kingship in Epic Mahabharata, Orient Blackswan, 246 pages, Rs.1050. A shorter version of this review was published on 14.1.2018 in the 8th Day literary supplement of The Sunday Statesman.